"Trumpets Personal Checks" product is already in your cart. For those who are musically inclined and love to play an instrument these Trumpets Personal Checks make a unique display. With four distinctive portraits of this brass instrument that offers challenges to play well, the colorful backgrounds of red, blue, green and gold add some pizzazz while still showing off the instruments. So if you are in a band or would like to play in one this will be an easy way to get started. 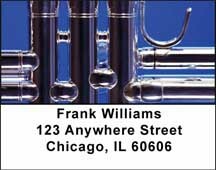 Music lovers will find these Trumpets Personal Checks a welcome way to practice their music and they promise that they won’t make any noise either!